One of Great Britain’s most outstanding solo viola players, Philip Dukes is no stranger to the orchestra. In recent years with the AST, Philip has performed the Bruch Concerto for Viola and Clarinet, and the Viola Concerto by Malcolm Arnold in the presence of the composer at St Andrew’s Hall, Norwich. He has also directed on several occasions at Salle Church. On Saturday 22nd June, Philip Dukes returns to Salle Church in Norfolk for a programme ideally suited to the ambience and acoustics of this wonderful Norfolk Church. The concert begins with Philip performing two baroque viola concertos by Telemann and Bach. The programme then continues with him conducting Dvorak’s romantic Nocturne, and Dag Wiren’s Serenade which includes the music made famous as the theme tune for the BBC Arts programme ‘Monitor’ some years ago. As AST audiences at Salle have come to expect, this concert with Philip will end with a light-hearted selection by Leroy Anderson: Belle of the Ball, Plink Plank Plunk and The Typewriter! 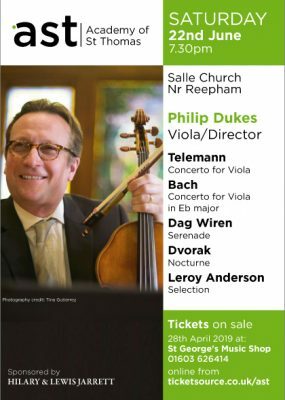 Don’t miss this opportunity to hear Philip Dukes, a leading concerto soloist who has performed and recorded with all the leading orchestras across Great Britain. In 2006, Philip Dukes was unanimously elected a Fellow of the Guildhall School of Music and Drama in recognition of his success as an international viola soloist, and was awarded an Honorary Associate of the Royal Academy of Music in 2007. Philip is also Professor of Viola at the Royal Academy of Music in London and Artistic Director at Marlborough College.